The University of Texas MD Anderson Cancer Center just got a turbo boost! This week, Gov. Perry made public the creation of the Institute for Applied Cancer Science which is aimed at turning scientific discovery into actual therapies! 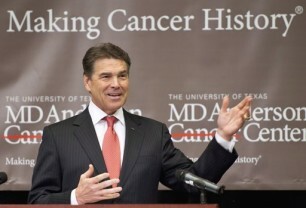 Back in 2007, Perry spearheaded a movement to make Texas a hub for the future of cancer treatment. This initiative spawned the Cancer Prevention and Research Institute of Texas (CPRIT) which was funded by bonds approved by voters, which allowed the state of Texas to finance research grants, allowing them to attract top talent. Since 2010, the Cancer Prevention and Research Institute of Texas has provided funding for over 350 awards for use in cancer research, commercialization and prevention. Also, moving the state of cancer treatment centers in Texas forward is the Texas Emerging Technology Fund (TETF), which was also created by Governor Perry. This fund, which has earned more than $800 million, has attracted cancer researchers form around the world. So far, the state has put forward almost $180 million to various Universities in Texas. The goal of the Institute for Applied Cancer Science is to gather top scientists and researchers who have expert knowledge of cancer clinical trials, genomics, biology and cancer drugs and pharmacology.